The first day of action of the Sweet 16 was highlighted by a dominant performance from No. 1 seed Kentucky. The undefeated Wildcats (37-0 overall record) completely manhandled the No. 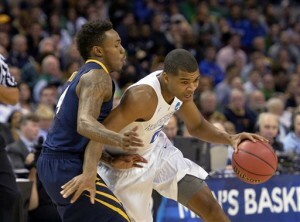 5 seed West Virginia Mountaineers, 78-39, in the Midwest regional semifinals in Cleveland, Ohio. Many college basketball pundits expected West Virginia (25-10) to wage a tight contest with Kentucky. West Virginia freshman guard Daxter Miles Jr. expected even more, courageously predicting the Mountaineers would hand Kentucky its first loss of the season. But that only pissed the Wildcats off, fueling their desire to blow West Virginia out. The result was a nearly 40-point margin in victory for Kentucky, and a loss for WVU that will go down as one of the worst in NCAA Tournament history as the Mountaineers scored the fewest points in a “Sweet 16” game since 1975. Five players scored double-digit points for Kentucky, including freshman forward Trey Lyles, who led the way with 14. Sophomore guard Andrew Harrison followed with 13 points and sophomore guard Aaron Harrison, sophomore center Dakari Johnson and freshman guard Devin Booker each added 12 points. Kentucky also was amazing on defense, allowing West Virginia just one double-digit scorer: senior guard Juwan Staten, who scored 14 points. Next – Kentucky continues on its quest to become the first team to finish the season and tournament with an unblemished record since Indiana did it back in 1976. The Wildcats will face No. 3 seed Notre Dame (32-5) in the “Elite Eight” round on Sat. March 28.